We were first struck by the strikingly different design of this shed, it certainly stands out from the crowd of other metal sheds available at similar prices, thanks to its pent roof, zinc plating, and sliding double doors. 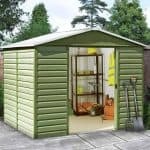 This not only makes it an attractive addition to a garden, in our opinion, it also makes it a very functional storage facility. The wide opening of the doors makes it easy to store everything from ride on lawnmowers to bicycles inside, as well as garden tools and equipment. If valuable items are being kept inside then security becomes paramount of course. Whilst a padlock doesn’t come as standard, the pad bolt system can easily accommodate one. The steel structure of the building, as well as the lack of windows, also help to ensure that this shed is well protected against unwanted intruders. It’s hard to believe that a metal shed of this quality is available at such an affordable price. The attention to detail is shown in the use of stainless steel screws that are resistant to rusting. This level of weatherproofing is replicated throughout, which is why the shed also comes with a 10 year anti-rust guarantee without any need for treatment by the owner. 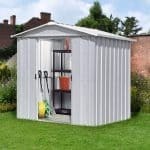 This metal security shed is an ideal low cost place to store your gardening equipment, but because of its clever design it is incredibly versatile and would make an ideal bicycle shed, for example. 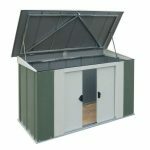 We we impressed by the look of the shed, as it is not only attractive thanks to the zinc plated steel, it also looks solid and sturdy which in itself can be enough to deter many would be shed thieves. The roof is of a pent design, which is a low cost way of ensuring that water flows harmlessly away. Measured at its tallest point, the roof has a height of 1.74m which is accompanied by an eaves height of 1.60. This means that taller owners may find it a little cramped, but it is after all a convenient place to store things rather than spend time in. The base of the shed is 1.84m wide and 1.04m deep, so these are the dimensions to take into account when selecting a suitably flat area to install the shed upon. When inspecting the metal cladding pre-installation we were a little concerned at its thickness of 0.35mm, although this was understandable at this budget price. When constructed however, it was stronger and sturdier than expected. On top of the base steel itself is zinc plating. 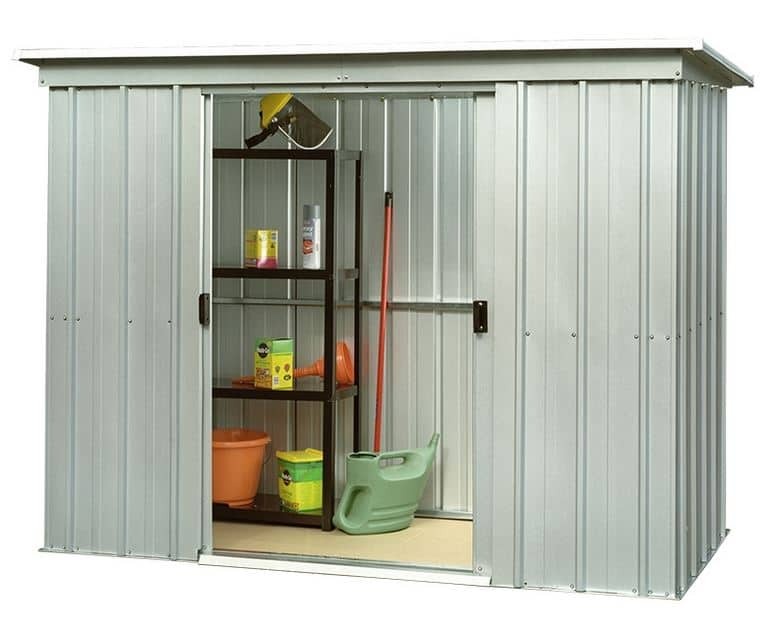 This gives a pleasant silvery look to the shed, and also prevents rust by stopping water and oxygen getting to the base steel. For extra protection against the elements a clear plastic resin has also been applied over the surface. 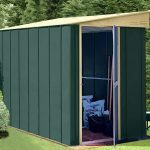 There is no floor included with this shed, but that’s because it’s designed to be erected onto an existing concrete base, or alternatively a flat paving area. It would have been nice to see the inclusion of a floor support kit so that a wooden floor could be installed if desired, but many people will be happy to leave the bare concrete as the floor. 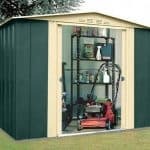 One of the greatest benefits of owning a metal shed is that no treatment is required by the owner, as opposed to wooden sheds which often need further applications of wood preserver on an annual basis. 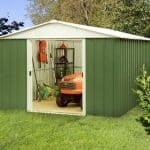 All that is needed with this shed is a hose down occasionally to prevent algal growth, and this can add up to a considerable saving of time and money. Thanks to the steps taken to prevent water reaching the steel core of this shed, the manufacturer has provided a 10 year anti-rust warranty, which we feel is a real bonus on a shed costing little over a hundred pounds. The feature that we liked most of all about this shed was the large double doors. They are situated internally and the sliding operation is effortless. The pad bolt system supplied will keep them firmly closed, and they are wide enough to accommodate objects that would be difficult to fit through traditional shed doors. At their full extent the doors are 0.79m wide, and they have a height of 1.58m. Windows are a valuable source of natural light for sheds that are going to be used for work or leisure activities but in a storage or security shed such as this we can appreciate their absence. Thanks to this design, there is no way that anyone can see what is being stored inside the shed and coupled with the strong look that the shed has, it can significantly reduce the threat of an attempted break in. The pad bolt supplied as standard is strong in its own right, but without a padlock offers no security, so we recommend a padlock and alarm as an essential accessory. 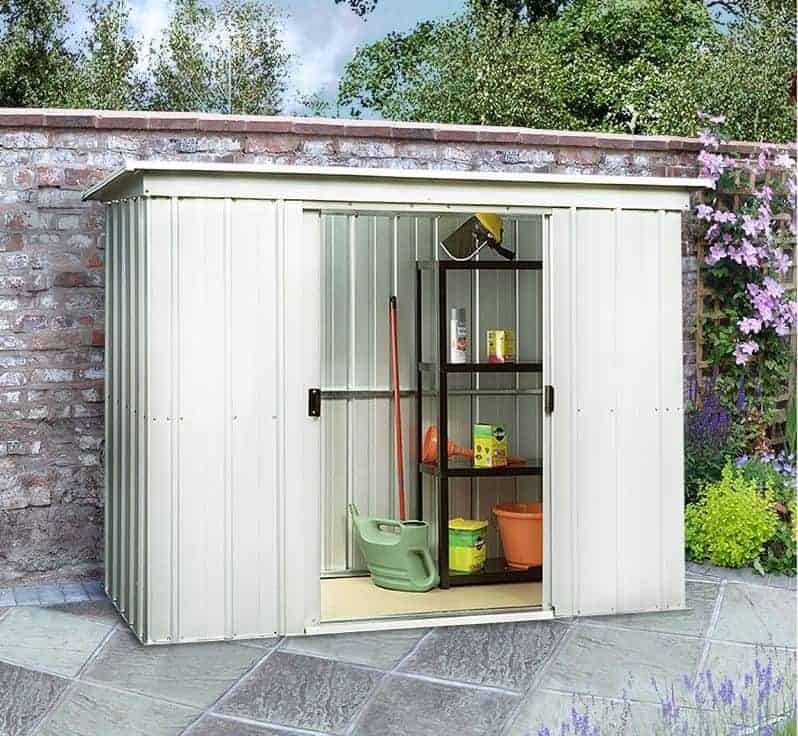 As well as the almost obligatory padlock that this storage shed will require, there are a range of optional extras that can make the storage options easier to use and organise. Foremost among these is a shelving storage unit, and they are available to purchase at the same time as the shed in a size of 2’6 X 1’8. Coated in a strong plastic resin, they are scuff and knock resistant and allow you to store small garden tools on multiple levels. A tool rack with wheels, from Tool-Plus, is also available. This allows you to store it inside the shed when not in use and then wheel easily out of the sliding double doors to wherever you need it. We liked the attention to detail on this budget range shed, including the interior setting of the sliding door and the rust proof screws and expansion bolts. A ten year guarantee against rust is very reassuring, and shows the benefits that zinc plating and resin coating can bring. There are much larger sheds available from Yardmaster and others, but we liked the fact that this shed makes the most of every inch thanks to the wide and accommodating double doors. We found that the instructions were concise yet easy to follow. If you and a friend work through the instructions methodically you should be able to install it within four to five hours. It’s hard to find a six foot by four foot storage facility that has a 10 year guarantee for this price, even when the cost of purchasing a padlock or alarm is added. Final Thoughts: Among many other positive qualities we liked the fact that this really is a no fuss and no worry storage facility. It comes with everything you need to install it in a handful of hours, including the base anchor kit to fix it to a flat area of concrete. Once installed, no further action is needed and it will remain rust free for at least ten years. Thanks to the wide sliding double doors it’s possible to get everything from a motorbike to a large workbench into this shed, and thanks to the absence of windows they’re shielded from the eyes of undesirable elements. 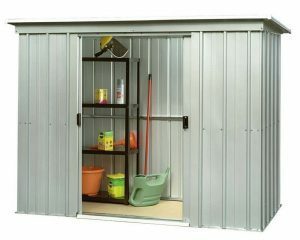 Overall, this is excellent value for a good quality small metal shed. looking for extra little flat oblong pieces , with a hole punched in for our 6×4 yardmaster pent metal shed purchased 03.04.2014 but only assembled two weeks ago. Cannot at this time give rating as just assembled. require a lot of these. Hope you can help!!!!! Hi Sam, I think the best thing to do is contact Yardmaster directly on +44 (0) 28 796 28270 or via email on info@yardmaster.co.uk Most manufactures have a spares department so lets hope they have the parts you need. If you contact Yardmaster directly then I am sure they will send you the replacement part.